It’s not a pot to boil water in, and it certainly wouldn’t be anybody’s first choice to plant flowers. It wouldn’t be involved in calling the kettle any names, but like its proverbial cousin it’s always referred to with the definite article — “the”, not “a” — if an article is used at all. It is, however, a kind of pot that genealogists run into all the time in the records, even if it’s often not called by its proper name in those records. So what is it and why should you care? Yeah. Right. That’s really clear, isn’t it? Seems that if you gave your daughter and her husband some land and limited the inheritance of the land to pass only to the descendants of both the daughter and her husband, that’d be land in frank-marriage.3 If you kicked off without a will, and your daughter wanted a share of the rest of your lands with her sisters (and that’d be without that inheritance limit), she had to give her frank-marriage land back into the mix and then take her share of the whole. And that whole was called the hotchpot. The word is still used in very much the same way when it comes to any estate where the decedent either didn’t leave a will or didn’t account for some property in the will and one or more of the kids (or heirs) got something from the decedent as an advancement on his, her or their share of the estate. Let’s say Father has one son and one daughter and 30 acres of land, and he gives the son 10 acres as an advancement when the son marries. If the son wants a share of the other 20 acres when Father dies, he has to return the 10 acres to the hotchpot and he and his sister each get 15 acres of the total 30. That’s an easy case. Now let’s say Father has four children, three sons and a daughter. During his lifetime, he gives an advancement of 250 acres of land to each of the sons, then dies without a will while owning a tract of 1,000 acres. Again, if the sons want a share of that 1,000 acres, they have to give the 250-acre tracts back into the hotchpot. But what if one of the 250-acre tracts is prime real estate and the rest of the 1,500 acres is mediocre? Now it gets really complicated. The first thing that would happen would be that the son with that particular tract might very well decide not to try for a share of the 1,000 acres and just keep what he had. Most states allowed that.6 The second thing would be that the other brothers and sister would probably file suit. And you know what that means, don’t you? Records. Lots and lots of court records. Whether the property ever goes back into the hotchpot or not, there would still be all those lovely records that we genealogists treasure so dearly. But there it’s called collation, and collation isn’t nearly as much fun as a word as hotchpot. Image adapted from Open Clip Art Library. We have encountered this within our own family recently here in the UK. An older person has lent money to younger family members to put down as deposits on houses (20% deposit is now required by most mortgage lenders). The money is to be repaid out of their share of the older person’s estate. 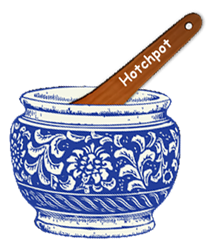 The solicitor used the term hotchpot to describe the arrangement, which was the first time I had ever heard it. That’s a perfect example of just exactly what this is! Except that from a technical legal perspective it’s probably more accurate to say that the older person had advanced money to the younger, rather than lent it. I totally love this article – and the word is indeed lovely to say! Since etymology is a hobby of mine, I had to look it up once again. Lovely word. And such an important unusual resource for genealogy. Thanks, Judy. Thanks for the kind words, Celia! How can you not love words like this!? !